WEST GLACIER – Few cars traveled U.S. Highway 2 as the morning sun shouldered into the September shadows draping the canyon of the Middle Fork of the Flathead River. But below the road and adjacent railway line, whitewater rafts were already slipping down a shallow tributary to start their trips downriver. At the confluence, the Middle Fork flows through an open valley and wide banks of fist- to football-sized cobbles lead to stands of cottonwood trees, some already turning yellow. The northern shore forms the border of Glacier National Park, where a few nearby mountains bear the scars of a recent wildfire. But now, they too are dappled with yellow and red as time has allowed some vegetation to recover. Mary Riddle, Glacier’s chief of planning and environmental compliance, squinted at the slopes as she rode in one of the rafts. “That’s prime elk winter range. I’ve often seen elk up there,” Riddle said, noting that the park boundary actually starts at the high-water mark. 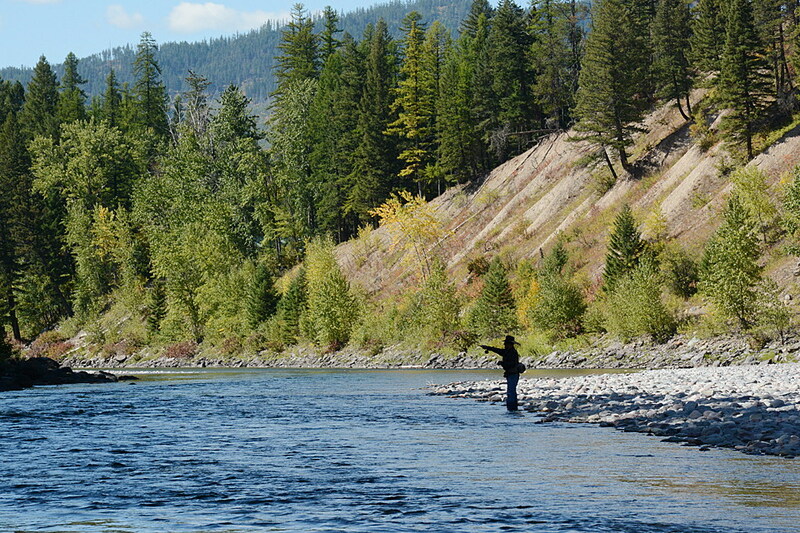 The river itself, along with the South Fork, is part of the Flathead National Forest. The remaining member of the family, the North Fork, is shared by the two agencies. Farther downstream, the mountains closed in, and the rafts navigated narrow sections of river bounded by walls of water-sculpted granite. The rowers leaned on their oars to avoid boulders exposed by the low fall flows. All along the way, the river runners reveled in the lofty mountains, the canyon crags and early autumn’s colors. But always, it was the river that commanded their attention, its gin-clear water providing more than a glimpse of the ecosystem below the surface. Gliding over deep blue-green pools, they pointed out trout and whitefish of every size sculling along the bottom above the ever-present cobble. As more people vacation in Glacier Park and settle in the surrounding area, American Rivers outreach coordinator Kascie Herron knows the river won’t remain this way without effective protection. “We have something really special right now. So let’s keep it that way. Let’s not lose it. And that’s what Wild and Scenic is about,” Herron said. Clear water. Native fish. Scenic surroundings. Thrilling rapids. These special characteristics draw people from around the nation to the Middle Fork. They also helped all three forks of the Flathead gain federal protection. During the past half-century, almost 13,000 miles of 209 rivers in 40 states and the Commonwealth of Puerto Rico have received protection under the Act. 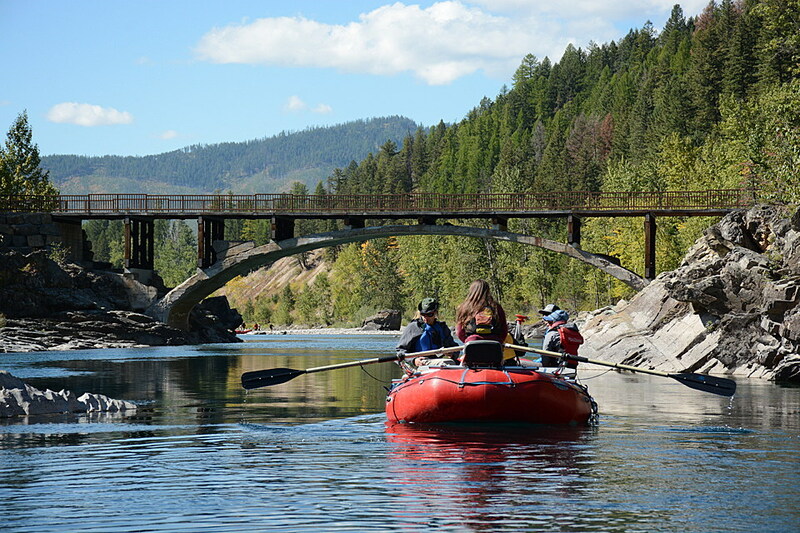 As a result, people who float or fish the three forks of the Flathead River can experience them in much the same way that University of Montana biologists John and Frank Craighead did in 1958 when they took their first float trip down the Middle Fork and made it their goal to save it. After spending several days floating through the wild country cradling the Middle Fork, the scientist-brothers realized federal protection was the only thing that could save wild rivers from federal development. “Rivers and their watersheds are inseparable, and to maintain wild areas, we must preserve the rivers that drain them,” John Craighead wrote in a 1957 Naturalist Magazine article. Since the 1930s, the Bureau of Reclamation had been driven to dam more rivers to provide for America’s ever-growing thirst for electricity. In Montana, the massive Fort Peck Dam had already been built across the Missouri River in the 1930s. Then, it took five years to plug the South Fork of the Flathead River with the Hungry Horse Dam in 1953. Four years later, it appeared that the Middle Fork of the Flathead would meet a similar fate. The U.S. Army Corps of Engineers had proposed the Spruce Park Project, a smaller dam that would turn the Middle Fork into an 11-mile-long reservoir above West Glacier. Water from the Middle Fork Reservoir would be piped below the mountain range to Hungry Horse Reservoir to run a new power plant. The Craigheads reached out to all the powerful people they knew to propose their idea, including Montana Sen. Lee Metcalf. But Metcalf was a proponent of hydropower at the time and didn’t yet see the need for river protection. So Sen. Frank Church of Idaho proposed the legislation in 1964, the same year the Wilderness Act passed Congress. It would take four more years before the Wild and Scenic Rivers Act was a reality. The law immediately protected eight rivers, but none were in Montana, the state where the idea was born, said Colter Pence, wilderness and wild & scenic river manager for the Flathead National Forest. “Montana citizens kept weighing in with Metcalf and others, saying, ‘No, the three forks are worthy of protection designation. How can you not have the inspirational river not be in the protected system?’” Pence said. Fortunately, the law required that the three forks be studied for inclusion in the system. After eight years, the Forest Service recommended that various sections of all the rivers be listed as wild, scenic or recreational. Now more than 40 years later, the Middle Fork still flows free and clear. But in a rapidly changing world, keeping it that way requires vigilance. Recreation has ramped up both in extent and the length of the season. 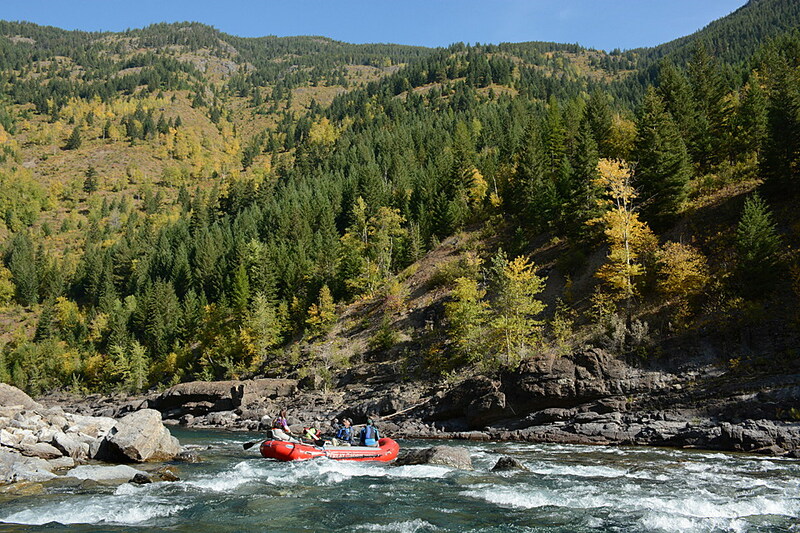 Whitewater rafting is now a thriving activity into the fall on the Middle Fork where once few boats traveled. More anglers fish the riffles and pools. Water quality is becoming a concern due to more people living and playing in the area and rising temperatures caused by climate change. But some things have improved in the intervening decades, thanks to concerned biologists and conservationists. Some wildlife populations, including elk, bald eagle, wolves and grizzly bears, and native cutthroat and bull trout are doing better. Riddle and Pence are taking all these aspects into account as they prepare to rewrite the management plan for the three forks that will guide protection efforts into the future. The first general plan for the three forks was written in the early ‘80s. Then a 1986 change to the Wild and Scenic Rivers Act required agencies to include specific details in the comprehensive management plans for every listed river. So the current effort will actually be the first full plan for the three forks, and Pence has been making sure every base is covered. As part of a three-year process similar to that of creating a forest plan, Pence and Riddle have held a year’s worth of monthly public meetings. Then comes a year of comment consideration, data gathering and analysis. Finally, they’ll write the plan and put it out to final public comment before hopefully finalizing it at the end of 2021. Pence predicted that most of the former plan would be used for the new plan. As Pence and Riddle work toward updating the protection of the three forks of the Flathead, organizations such as American Rivers and various Montana communities are working to secure protection for a few more rivers. Last month, after six years of lobbying, some Montanans finally convinced Congress to list 20 miles of East Rosebud Creek under the Wild and Scenic Rivers Act. Residents along the creek were moved to action after a hydroelectric dam was proposed below East Rosebud Lake in 2009. Taking their cue from East Rosebud Creek, Montanans for Healthy Rivers created an initiative in 2015 to analyze another 50 streams and rivers for inclusion in the Wild and Scenic system. But as the East Rosebud situation shows, designation requires a lot of support from local communities to sway Congress. Unfortunately, only a minority of Americans are aware of the Wild and Scenic Rivers Act. Few of the tourists bobbing down the Middle Fork know that it is protected. River guide Phillip Groseclose estimated that only about 20 percent of his customers seemed familiar with the law, its protection or the 50th anniversary. Pence said more education is needed because wild and scenic designation is not about stopping dams – it’s about preserving resources that provide recreational, economic and health benefits to Montana residents. Ask just about anyone in West Glacier, from raft company employees to hotel managers, and they’ll tell you how much they value the benefits of a protected Middle Fork, said Danny McIntosh, marketing manager of Pursuit, Glacier Park Collection. On the Flathead National Forest, Pence has documented several streams with “outstandingly remarkable values,” from trout populations to scenery.